How to Fix an iPhone Stuck in Headphone Mode? You are here: Home / Troubleshooting / How to Fix an iPhone Stuck in Headphone Mode? Recently my iPhone got stuck in “Headphone” mode. When I receive calls am unable to hear anything and if I increase the volume level the volume indicator shows “Headphones” instead of “Ringer”. I thought iPhone speakers is broken then I browsed internet and got a quick fix to this issues. 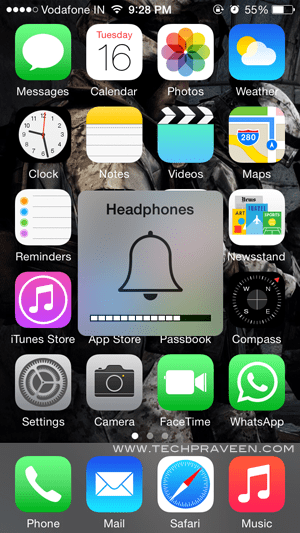 Why iPhone Got Stuck in “Headphone” Mode? If your headphone jack gets wet due to moisture content the iPhone thinks that headphone is connected. So, all you need to do is remove the moisture content by using vacuum cleaner in “Headphones” jack. Another reason is that your call audio setting got changed to “Headset” due to some reason. This solution works if your iPhone call settings are changed to “Headset” and not because of moisture content. The below step is based on iOS8 and if your using earlier versions the setting will be different. Now check toggling the volume up/down buttons should just show “Ringer”. If the above method doesn’t work try the below method. If the above said point is not put your Vacuum cleaner in blower mode and blow hot compressed air directly into the headphone jack, this may help to dislodge dust or pocket lint stuck in the port. Note: You can use hair dryer also in place of vacuum cleaner. Now toggling the volume up/down buttons should just show “Ringer”.